Hello, everyone. Welcome to the eCommerceFuel Podcast. Thanks so much for joining me. Good to have you with me on the program. And I’m excited today because I get to do a deep dive with a company that I have admired from afar for quite a while, and that’s a company called Peak Design. 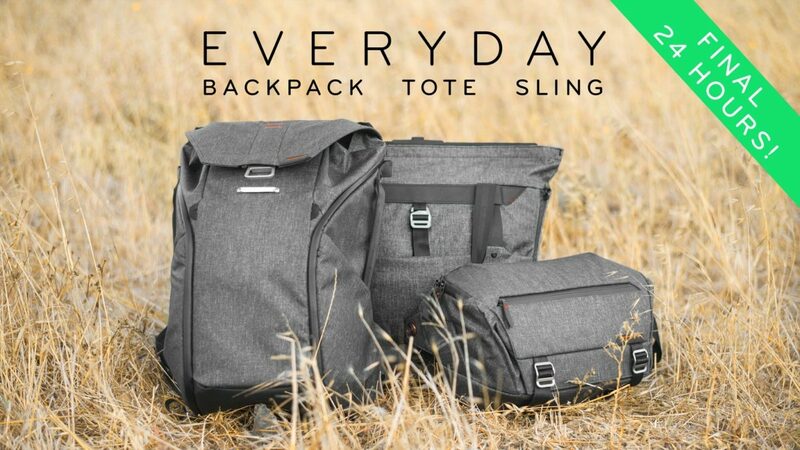 If you’re not familiar with them, they create products for photographers, hardware products, but also very innovative, extremely well-built and well thought out backpacks, messenger bags, things like that. They are, I think it’s safe to say, I think it’s very safe to say, probably the most successful company today. They’re still really active thriving in 2018 that has leveraged Kickstarter to grow their brand and their business. They’ve raised over $14 million dollars just through Kickstarter alone in the last few years, and that’s not the revenues. I’m sure they’ve done much more than that, but that’s just the amount that they do on Kickstarter. And they really leveraged Kickstarter as the platform and medium to launch their new big products to the world. So, we’re gonna do a deep dive on that today. We kick things off with kind of a pretty interesting/disastrous story from one of their Kickstarter campaigns, but then really dive into how they do it. What’s their magic sauce for everything, from gearing up for the launch, to thinking through how to make sure when they launch, they’ve got a huge amount of momentum behind them that they can unleash. We talk about what to do on launch day. We discuss paid traffic. A lot of firms and lot of campaigns today use paid traffic heavily to get where they are, and Peak Design does it too. They wouldn’t necessarily have to, because they have such a great reputation and such a following, but they choose to. We talk about why. And then we talk about even, you know, kind of halfway through the campaign, all the way through as you wrap up, a whole blueprint for how they do this, and their world class of it. So I really want to chat with them about, of course, their blueprint, but why they continue to embrace that platform today when they don’t necessarily have to. So, Adam Saraceno is their Chief Marketing Officer. He’s the man joining me today. And hope you enjoy the discussion, because I had a lot of fun. But before we jump in, I wanna take a minute and thank our fantastic sponsors for us. A huge thank you to Liquid Web, who offers world class web hosting for your WooCommerce store. So, if you’re on WooCommerce right now, you’re not gonna get better host than these guys. These guys are phenomenal. I host all of my stores with them, eCommerceFuel, Directories is hosted with them, my blog, my WooCommerce store, everything is hosted with these guys. Three big reasons why you should consider hosting with them: first, incredibly elastic platform. They’re gonna be able to scale up with any traffic that comes your way, so you’re online when, you know, it’s most important to build or close sales. They know WooCommerce and WordPress so well. This is their bread and butter. Automatic upgrades, backups, all sorts of tools to stress test your store. The whole hosting environment is architected for WordPress. And all of their customer support and their tech support knows Word Press and WooCommerce. If you call them up, all of their phone support is all stateside. These guys know their stuff. So if you’re on Woo and you want a rock solid platform to get your store up and running, and to keep it running smoothly, check them out at ecommercefuel.com/liquidweb. And then secondly, an enormous “Thank you.” to the team over at Klaviyo, who sponsors the show. Klaviyo, who makes email automation easy and powerful. What they do, in a nutshell, is they let you make more money with email through sophisticated segmentation and personalization. So, marketing is all about getting the right message to the right people, at the right time, and with Klaviyo, you can do that in an…you send the time to set up some of these flows, and they just more or less, generate ROI for you while you sleep. This is one, I mean, that’s an example I kinda pulled out of thin air, but you can do that with all of your different products, all of your different scenarios. With your VIP customers, you can set automated flows to say “Thank you, and here’s a special discount.” The possibility is really endless. So, if you’re not doing email marketing like you should be, or if you’re on email platform that doesn’t let you do this really cool type of, you know, segmented personalization, check them out with a free trial at ecommercefuel.com/klaviyo. All right, thank you to both our sponsors, really appreciate your support. You know, with that being said, let’s go ahead and jump into my discussion today with Adam, from Peak Design. Adam, I wanna kick things off by asking you about the time you guys manufactured a ton of camera straps that had defects, and the ensuing chaos that came after. Can you talk a little bit about that? Hey, Andrew, quick little sidebar. One thing I wanted to clarify after the chat with Adam, after the podcast, was that Peak Design, they went ahead and quarantined all of the units that had this problem in their supply chain, and none of them ever made it out to retail. So, they were pretty aggressive about getting taken care of. So, I just wanted to make sure that I mention that. All right, back into the discussion. Adam: Sure. Cool. What a grim thing to open up with? Yeah, so this was in 2014. We launched Slide and Slide Light, or Slide and Clutch, which were a couple of cameras straps, via Kickstarter. And it was a really successful campaign. We raised upwards of $800,000 over 60 days. Then we get about five emails the next day, and then about 30 emails the next day, and then we realized that we had a major problem whereby there was a manufacturing defect, where one part had been made not quite to tolerance, and because of that, the camera straps would actually drop the camera if just kind of pushed just in the right way. And then we had a big media hit right about that time on Pedo Pixel and on FStoppers, which are two be camera blogs of…Actually, a writer for that company had basically dropped the camera and broken it, and we thought, “Boy, this is it. This is what’s gonna do us in.” It didn’t, because, luckily we, well, the first thing we did was we went back to our backers and we said, “Hey, guys. We messed up big time. Put down your camera straps, don’t use them. And we just kind of treated it with full transparency. We explained to our backers exactly what the defect was, exactly what had happened. We sent them videos. We immediately booked trips over to factories that we had set up in China that were making the straps. We were kind of giving them daily and weekly updates on what we were doing to fix it. Within months, luckily, we were able to actually create a kit that people could be sent to just kind of pop up their old spring and pop in a new one, and they would have a camera strap that was totally functional, and totally safe, and good as new. I think because of that sort of transparency, and because we had that conduit of communication Kickstarter between us and our customers, I think we emerged from it better than what probably had started. We got a ton of goodwill, a ton of support from our backers that were like, “Hey, we get it. Sometimes you mess up. Thanks for being honest with us.” So, it didn’t do us in. We’re still here. Andrew: And I mean, of all the things that you don’t wanna be dropping, you know, $3,000, $4,000 digital cameras comes to mind. I mean, it kind of ties into a question about Kickstarter, you guys have been around for you know, years and years, done over $15 million or close to, you know, over $14 million on Kickstarter, half a dozen campaigns. I would say it just seems like maybe you’re definitively, have you raised more money than anyone else on Kickstarter as a company? Adam: There are companies that I believe has raised more than us, but we are the most crowd funded active brand right now. Pebble has since been purchased by another company. So, yeah, cumulatively, over now seven campaigns, we’ve raised about $15.5 million. Andrew: It’s amazing. And do you launch all new products on Kickstarter? Is that the only way you bring products to market, or is it only, you know, when it makes sense? Adam: Not everything, but most of our new big products, yes, we launch on Kickstarter. We will do sort of what we call mid-season launches of, you know, a new color way, or a new size, or maybe a smaller accessory. But, you know, if we have something big and new to share with the world, we definitely will use Kickstarter as the launch platform. Andrew: And why, so far into the business, why continue to do that? I mean, there’s yes, you know, you can tap into the kickstarting platform but you pay for it. I think it’s 10% that you pay for, for all the things that you raise. It’s a lot of work, as we’re gonna get into, designing a great crowd-funding campaign and the video, and, you know, all of that. You’ve got an audience, you’ve got a great email list, you’ve got people who love your products, why continue to do Kickstarter at this point? Adam: That’s a great question, and one that we get asked a lot because I think Kickstarter is often perceived as, well, it’s called Kickstarter, it’s perceived as a company launch pad and not as a sort of continual business model. But for us, we’ve actually found that, I mean, we sort of have found no reason to not continue using it. You know, for us, Kickstarter is equal parts marketing and finance. And that financial independence, you know, because we run a big Kickstarter campaign every year, we are able to kind of run our company without major outside investment. So, we don’t have any like equity shareholders of our company, it’s just us, and our customers, and our Kickstarter backers, and therefore, we sort of view Kickstarter as something that allows us to continue doing what we love, which is designing great products. Without Kickstarter, we feel that we would sort of maybe be burdened by a less pure product design process, one where you have these kind of external stakeholders, people that are investing in your business, that are sort of requiring returns or, you know, just wanna sit at the table on how you’re doing stuff. You know, without that, we can kind of just fully focus on designing the products that we think are surely the best. Andrew: You mentioned the marketing aspect, of course, and the finance, which makes a lot of sense. How much of it is the relationship with customers? I would classify myself as someone who almost never makes impulse purchases, almost never, with one big exception, and that is Kickstarter. You know, like just this last week, I backed a, you know, a new French press because I thought it was phenomenal, and I loved the design, and I felt like I knew the company, you know, the founder behind it, and there’s a…I felt like you almost even build rapport with a well done Kickstarter video that you can’t in other ways. I imagine that probably ties into, at least, partially you guys stick with it. And also, thinking through like that, you know, the snuffing you had with the camera straps failed, I’m guessing because of the Kickstarter campaign, you probably got a lot more understanding and empathy from your backers than you would have just random kind of customers who didn’t know you as well. Adam: Yeah, absolutely. I mean, Kickstarter brings us face-to-face with the best customers that you could possibly ask for. And, you know, part of that is that it’s a communication platform, but, you know, yeah, it is a platform that allows a customer to become sort of very intimately familiar with the person or company that is making the thing that is solving their need. There’s just a lot in goodwill that comes out of that, you know, so I totally agree. And it’s interesting, you know, like I think there’s plenty of people that Kickstarter purchases are impulse buys, but it’s actually a very, you know, on Kickstarter versus our other platforms, our customers drill us with questions. You know, they wanna know everything. These people are, they tend to be early adopters. They tend to be super passionate about what you’re doing and how you’re doing it, and they wanna know everything. So, you know, we go into incredible depth on every nook and cranny of every bag and camera accessory, and everything that we launch on Kickstarter. We really have to go deep on it. We have like weekly hangouts, video hangouts with our backers, where they can ask us anything, and we’ll all stand there and answer it and, you know, kind of give them an inside view on the latest prototype. Andrew: I mean, you have such a unique, and you probably have more so than maybe anyone else, a really unique perspective on how crowd funding has changed and evolved over the last, you know, seven, eight, nine, ten years. How has it changed launching something on Kickstarter back from your first campaign to today, 2018? Adam: You know, it hasn’t changed that much, I would say. Certainly, the platform itself has not changed that much. Kickstarter has stuck pretty true to their sort of initial goal and platform, with the exception of a few functionalities and features, and usability tweets. You know, the Kickstarter page of today looks a lot like a Kickstarter page of 2011. Another important thing that hasn’t really changed a whole lot is the number of people who have ever backed a Kickstarter campaign. I think it’s over 13 million people have ever backed a Kickstarter. And if I remember right, that number three or four years ago was like 11 million. So, it’s interesting, like there’s not a ton of new people coming to the platform, but the people that are they are kind of continue to come back. And then, you know, with the public perception of Kickstarter, I think when it first came out, nobody quite knew what to think about it, something that we’ve…I sometimes think that we hit it at a very lucky spot, because when we launched in 2011, a big key to the success of that campaign was that Gizmodo paid us up on day three, and like ran an article about us, and it was just like, boom, we were on the map. Nowadays, most, you know, most media sites as a rule, will not cover Kickstarter projects. So, I think there’s maybe a more of an uphill battle than there was before. I think there’s also just a ton…there’s so many more projects, there’s a lot more millions, it’s a lot harder to speak out on Kickstarter like we were able to kind of so easily back in 2011. Andrew: How many more campaigns are competing for that attention? Most, not all, but I would say most campaigns that I see that do six figures these days, they launch organically. You know, they’ll queue up kind of a PR blitz beginning to launch, they’ll kind of tap into all these people they have lined up, and then they’ll run for two, three, four days, kind off that original burst, and then of course, you get that lull, and they’ll supplement that with, you know, a company funded today, or one of others that are out there that will come in, and they specialize in using paid traffic to continue to really grow that campaign. So, is that something that like…I guess two-part question for you then, one, do you guys do you that? Do you guys kind of use paid advertising to really grow those Kickstarter campaigns that you launch? And if so, do you think that’s something that like is, you almost have to do today to get decent traction to break that six-figure mark? Adam: You know, paid up advertisement is a big part of our strategy. We use a company called Jellop. They’re a shop based on a tele-viewed. Super cool guys. We love working with them. You know, it’s definitely a part of our strategy, and it’s just sort of something that we know we’re gonna do. The great thing about these companies like Jellop and Funded Today, are that, you know, like you said, they’re experts at reaching not just the people that might find your widget interesting, but they’re finding those people who are also really familiar with the Kickstarter platform, and have likely backed other projects in the past. That’s actually the super important part of it, kind of going back to the whole only 13 million people that have backed a campaign, you know. If you’re bringing somebody who’s never backed a Kickstarter campaign, or never seen a Kickstarter page to a Kickstarter page, they don’t really know what’s up at first. You know, it’s a non-standard eCommerce experience, and it doesn’t kind of fit the paradigm that’s in their head of like, “Okay, add to cart, check out,” and so they need a lot more handling. So, long story short, the beauty, you know, and the value of using something like Jellop is that they’re finding those people that are gonna be most likely to convert. They’re making sure that those people are getting to your page. I’ll say all this with a caveat that we can never just hang our hat on, you know, well, paid ads are gonna make us hit our goal. You know, it’s a part of a much bigger strategy that we employ to run successful campaigns. Andrew: I’d love to, you know, walk through the anatomy of a successful Peak Design Kickstarter launch, because you guys have nailed it so many times. Obviously, a huge part of that is you gotta have a great product, right? And you have to have a good story behind that to tell, but an enormous part also is being able to market it well, and to get the word out. So, how do you… get there kind of focused on the marketing side of this first versus the products side? Assuming you’ve got a great product, what do you do before you go live? What are the things you really have to have in place? How are you thinking about making sure that when you launch, you’ve got that momentum that you can unleash to get the project off to a good start? What are you doing to prepare for that launch? Andrew: Sorry to interrupt, what did you call…you called them BD, is that business development units? Adam: Oh, excuse me, media units. Andrew: Oh, media units? Okay, got you, sorry. Adam: Yeah. Just being able to get the product in the hands of journalists, and influencers before you launch, or if not before you launch, sometime during the course of that campaign, so that they can kind of feel it and experience it, and really, you know, when they do share your campaign, really do so in a convincing manner, and put a little oomph behind it. That’s big for us. Another thing that we kind of do to build the buzz at the beginning and come out the gate with a bang, is we sort of run a, kind of about hack of an affiliate program where by Kickstarter, in your project, you can create unique tracking links to your project. We create those before we launch. We send it out to, you know, media and influencers, and then we basically say, “Hey, at the end of this campaign, we will sort of pay you a 10% or 15% share of the funds that come through from your link. And because Kickstarter is tracking uses first click attribution, all the incentive is for them to, you know, share that link first thing right when your project launches. Andrew: Interesting. So, you kind of broke this down to media and influencers. For media, can you give me a sense of who you’re reaching out to? And it’s gonna be a little different, you guys obviously have such a good reputation in the space. You’ve done it half a dozen times, people know you’re gonna deliver on great products, so you have a little bit of a, you know, an advantage, a well-earned one. What do you do, like let’s say, do you have any thoughts or suggestions for people thinking about trying to get out to the media maybe if they’re less well-known? What are the important things to do, maybe to get in the mindset of that media person? Because I’m sure a lot of, I mean, media people in general just get pitched all the time, so any thoughts on how you can stand out with a physical product and get them to maybe get some coverage for you when they’re swamped with other things? Adam: I think that like that hire, you know, for us, we outsource that. We have a PR agency. They’re a real small company called Purple Orange in Jackson Hole, Wyoming, and, you know, they manage our media outreach. And it was something that we tried ourselves, you know? A big part of my job back during our first few campaigns was sending out all these cold emails and follow ups, and trying to get people’s addresses to send them things. It’s a really hard thing to do, and, you know, it’s why PR agencies exist, because there are people who sort of have these relationships with media built up, you know. So, I guess my long story short recommendation is it’s worth hiring a PR agency. There are, I think, a lot of, sort of there’s a lot of PR agencies out there, and PR “services” that prey on Kickstarter creators and sort of say offer for, you know, for a certain amount of, you know, for $500 they’re gonna send an email out to 50,000 media contacts. Those are almost, you know, I really think that they are a total farce, and they’re taking advantage of people that have limited experience with PR. So, you know, in the end, I think it’s really worth seeking a legitimate PR shop, you know, even if you have to pay them, you know, $3 grand, $4 grand, $5 grand a month, they do really good work. Andrew: And then influencers was the other side of that. Is that something that you guys also outsource to somebody else? Do you keep that in-house? How does that work? Adam: I think the line is sort of blurred between media and influencers nowadays. So, there are certain folks that our PR agency managers relationships with, and there are certain people that we manage relationships with. You know, ultimately, our philosophy with influencers is that is basically, we’re gonna become friends with people, and, you know, we’ll give them products, and in some cases, maybe we’ll pay folks to create content or things like that. But I think over the years, we’ve built up sort of enough friends, enough like believers, in our company that we don’t, you know, we don’t sit down with folks before a Kickstarter campaign and say, “Okay, we’re gonna pay $500 for this Instagram post, and if you do this Instagram story, $300.” We just don’t do that anymore. We have our friends in the business, and we sort of scratch their back and they scratch ours. Andrew: So, you get to launch day, and you get ready to launch. You click the button, and of course, you’re telling all, you know, you’re probably sending out email to, or your PR firm is sending an email to all the contacts that they have, especially the warm ones. You’re reaching out to those influencers, those friends, those good connections that you’ve made. You’re sending your email list out. What else do you do on launch day to get the word out? Or is that, really, the bulk of it? Adam: That’s really the bulk of it, right there. You know, we’ve done so much tree work up until that point that, you know, on launch day, we press ‘Go’ and then we just pull all the levers, you know, all of which, you know, there’s been quite a bit of pre-work going into it. I think another general theme that we were often sharing with first time Kickstarter creators is that, you know, when you’re pressing a launch on your Kickstarter, you want to have already done, you know, months of pre-work, you know, of creating that collateral, and building that buzz, and kind of priming your network for that day. There’s equal, I mean, equally much more pre-work to be done on the product side too. You know, having a product that’s, basically, ready to press the “Produce” button on, the manufacture button on, is also pretty important. I think a lot of first time creators launch with something that’s much closer to concept than finished product, and then that’s how they kinda get themselves into trouble in that fulfillment stage where they thought something was gonna be ready in October, and it’s February next year and they’re still ironing out kinks, you know? Andrew: Yeah, I’ve backed a few of those. Those are frustrating. Can you give me an anecdote? I mean, I’m thinking about the launch you did recently, of kind the, you had the everyday messenger, which I think is the first one that I kind of really put…where I got to know who you guys were. What’s it like in the office when you guys have, you know, months and months of work, you press the button and everyone just kind of sits back? The closest thing I can imagine is doing like a big site redesign and migration, and you press it live, and four months, five, six months of work, all goes live at once. What’s that like? Any thoughts or anecdotes you can share around for when those go live? Because that’s gotta be so much fun. And then we just kind of relax and have some beers that first night, just to let it slide and sort of, you know, kind of take a breath and get ready for the, you know, upcoming 60 days of hard work. Andrew: In terms of a video, I love you guys’ videos. When we first hopped on before we started recording, I instantly could recognize your voice as the, you know, the voice on your videos, which is cool. We could probably do an entire episode just on putting together a great Kickstarter video, but what are the things you really try to do well, you know, maybe the two or three things that you try to really nail in a Kickstarter video for it to be successful? Because I feel like of all of the Kickstarters I’ve ever backed, it was because the video was well done, it spoke to me. Obviously, it has to be a good product, but the video is what sold the deal for me. Adam: Yeah. I mean, for us, you know, specific to Peak Design, we make very, sort of, functional products, and we need to really nail, and do so early, the value proposition. Like, what does this thing do? Why is it the best? And kind of quickly hammer home the main points about why, you know. We also try to really just go into as much visual detail that we can on the product itself, you know, like get them familiar with every little piece of hardware, and strap, and show the backpack on a bunch of different people in a bunch of different environments. You know, show how the zipper opens up, and how you access this pocket, and you, you know, undo this latch, and really just kind of like…You know, people ultimately, when they’re supporting you, they’re pretty ordering your product, and you know, they’re stoked about your business. They wanna support you, but ultimately, they’re there to get a cool new backpack, and so that’s really where we try to keep the focus of our video. I think secondary to that is telling kind of the story of who we are, and how we got there, sharing our design philosophy and process. You know, Peak Design has a unique business model, so we try to kind of make sure that people understand what that is, and why we think it makes us special. So, every company has their own story, you know? It’s a different ballgame, I think, making a Kickstarter campaign for a new album, or an art installation, you know, or an app, versus a physical thing that you hold. You know, the story’s gonna be a little bit different for everybody, and I think that that sort of like video equation is gonna be a little bit different for everybody as well. Andrew: So once you launch, when do you start using paid traffic? Because I’ve heard, you kinda make two arguments. I’ve actually chatted with a couple of different Kickstarter founders who, they wait until that initial launch wears off, because in their minds they say, “Well, if I’m gonna pay…” because, at least, the way they had it set up with the people who are running their paid advertising, is they paid a percentage of every acquisition that came for a certain period of time. So they used all the bullets they had in their chamber, and then once they didn’t have anything left, then they went ahead and brought in someone else so they wouldn’t have to pay extra commission unnecessarily. Whereas you could also make the discussion, I think you probably will, or the argument rather, that, you know, you spend a lot of your paid traffic right from the get go to get as powerful of a launch as possible, is that the way you guys do it? And what makes you do it that way versus the other option? Adam: Yeah, we’re definitely more of the latter. We concentrate our paid ads at the beginning and at the end of the campaign, when we’re seeing our highest conversion rates. That’s a strategy that’s sort of promoted by Jellop, our sort of partner record there. But in general, yeah, during the middle part of the campaign when, you know, when things slow down quite a bit, conversion also slows down quite a bit, and so we find that paid advertising is not necessarily the best strategy to use, unless we really have something kind of new about that campaign to share. So, one of our strategies for kind of creating bumps during that long, middle period is to, we’ll often sort of release a secondary product, or a accessory to that hero product of the campaign midway through. And it gives our backers a reason to come back, gives people a reason to share about, and it gives potentially, media, a reason to talk about it. You know, during then, we will sort of then maybe do a small paid push, but really only if we have, you know, kind of something new to offer there. Andrew: What about the Kickstarter algorithm in and of itself? Of course, all these other things you’re sending to people that are off site, or that are on the email list, or media, or influencers, right to the page. But, of course, you know, a lot of people…though this is the way I usually find campaigns, is I’ll just head over to Kickstarter every, you know, couple of times a month, see what is trending, what’s popular, what pops up in the technology section. Is there, and I’m sure there is…any thoughts on how you get to the top of that for kind of organic discover when people are on the website? Is it totally a function of how much money you raised how quickly? Or is it more nuanced than that, like, you know, Kickstarter is looking at the views of the videos? Any thoughts for being able to be as high as possible in the rankings on the Kickstarter homepage? Adam: Yeah, I don’t know the exact algorithm there, but, you know, I think it has to do with your total planning amount, it has to do with how many people are coming to your page and leaving comments, and how many update you’re creating and how much engagement there is there. So, there’s definitely a number of factors that go into there. But, you know, that’s kind of the reason why we really try to build huge out the gate, so that when we do go big, we sort of get that additional boost by kind of being one of, if not the hottest projects on Kickstarter for a handful of days. And it always blows my mind at the end of a campaign how much of our funds are, you know, attributed to, essentially, people browsing the Kickstarter platform. Granted, you know, these are Kickstarter’s analytics, and so one might argue that maybe they’re over attributing. But even if they are, it’s still pretty incredible to see how many people find out about our campaign through Kickstarter itself. We do independent surveys after our campaigns, and it’s always one of the top, you know, when we say, “How did you first hear about this campaign?” most people, you know, or at least, a big chunk of people say Kickstarter itself. Andrew: Wow. What percentages is that? Is that a quarter, 30%? Adam: That is a great question. It’s probably closer to a quarter, you know. Thinking back, I know that when we ask people, simply that people got and bought our products, and they’re registering them online. So, they could have bought it at a retail store, or at Best Buy, on Kickstarter, on our website. We know that about a quarter of the people that buy and register our products, when we asked them like to close their eyes and think about how they first heard about Peak Design, about 25% say Kickstarter. So, that’s kind of just a testament to, you know…I mean, that’s why we keep going back, really. Andrew: Is that how you phrase it in the survey, “Sit there, close your eyes, hum softly, and try to go back to the time when you first heard about us”? Adam: Yeah. Put yourself in a happy place, exactly. You know, we try to make our surveys fun and engaging. Andrew: I love it. I wanna talk a little bit about kinda your culture and stuff, but the last question here before we move on from the Kickstarter mechanics covered, I think most of the lifecycle, at least in terms of, you know, the pre-game, the launch, and then, I guess we didn’t talk about wrap up, but maybe as we close out this section, thoughts at all on things you should be doing at the very tail end of your campaign as it closes, or anything else that we’ve missed that’s of real critical importance for launching a successful campaign from a marketing standpoint? Adam: You know, I think just a general important thing is to really put, Kickstarter is not set it and forget it. I think a lot of first-time creators turn it on, and maybe turn their ads on and kind of sit back and hope for things to happen. And, you know, for us, it’s a very different experience. We are sort of every week, trying to get as kind of like intimate and engaged with our backers as possible, to answer their questions, to have hangouts with them, to share with them pictures of our latest factory visit, or, you know, quick videos of our latest prototypes. It can be stuff that you take on your phone. It doesn’t have to be, you know, pretty, it’s just people…people eat it up, and people really wanna be a part of it. You know, when you make people a part of it, you’ll often kind of learn things about how you’re telling the story, about how you’re sort of marketing the product, or maybe even things about the product yourself, that you wouldn’t have otherwise learned. Looking back, there’s a number of kind of like little features or tweaks, either to our products themselves, or a messaging, that we learned simply from engaging our backers, you know. And things to do with the end is just, I would recommend having a countdown hangout, that’s for sure. Get all our customers in there, you know, and toast together. We’ve actually, for our last few campaigns, have had like a little countdown party somewhere in San Francisco. I’d just encourage anybody who’s out in the bay to come and join us, and have some drinks and, you know, toast to a fun and exciting campaign well done. Andrew: Hey, guys, Andrew here. I’m gonna jump in, and we’re actually gonna end the episode today right here, because we kinda start transitioning from Kickstarter into some other marketing and cultural things with Peak design. But next week, we’re gonna have part two of this episode where I talk with Adam about some of the core values of their company, why they’ve decided to prioritize happiness as a company over growth, what that looks like, what that means. We’re talking about why they decided to start a brick and mortar store in San Francisco. Adam shares what’s working best for him and Peak Designed on an ROI/return on ad spend basis. And we just talked about kinda culture and marketing in kind of a general sense beyond the Kickstarter. So, if you enjoyed the talk today, make sure you check in next week when I pick the discussion back up with him. That’s gonna do it for this week’s episode, but if you enjoyed what you heard, check us out at ecommercefuel.com, where you’ll find the private vetted community for online store owners. And what makes us different from other online communities or forums is that we heavily that everyone who joins to make sure that they have meaningful experience to contribute to the broader conversation. Everyone who we accept has to be doing at least a quarter of a million dollars in annual sales on their store. And our average member does seven figures plus in sales via their business. So, if that sounds interesting to you, if you wanna get, you know, connected with a group of experienced store owners online, check us out at ecommercefuel.com, where you can learn more about membership, as well as apply. And I have to again, thank our sponsors who help make the show possible. Klaviyo, who makes email segmentation easy and powerful. The cool thing about Klaviyo is they plan your entire catalog customer and sales history to help you build out incredibly powerful automated segments that make you money on autopilot. If you’re not using them, check them out and try them for free at klaviyo.com. And finally, Liquid Web. If you’re on WooCommerce, if you’re thinking about getting on WooCommerce, Liquid Web is the absolute best hosting platform for three reasons. One, it’s built from the ground up for WooCommerce, and optimized by some of the best industry professionals in the WooCommerce and WordPress space. They really know their stuff. And it’s highly elastic and scalable, as well as comes with a whole suite of tools and performance tests to optimize your store. You can check them out and learn more about their hosted WooCommerce offering at ecommercefuel.com/liquidweb. Want to connect with and learn from other proven eCommerce entrepreneurs? Join us in the eCommerceFuel private community. It’s our tight-knit, vetted group for store owners with at least a quarter of a million dollars in annual sales. You can learn more, and apply for membership at ecommercefuel.com. Thanks so much for listening, and I’m looking forward to seeing you again next time.